Every year the Pittsburgh Section of SME presents an award at the Pittsburgh Regional Science & Engineering Fair (PRSEF). The project that receives the award is related to the application of mining and mining engineering or the fields of geology or mineralogy, with a focus on creative or innovative uses of modern technology, such as electronics, computerization, and/or robotics, in mining, mineral exploration, geology, mining equipment, miner safety, or mine rescue. The SME Pittsburgh Section is pleased to present the SME-PRSEF Student Award to Meghna of North Allegheny High School. 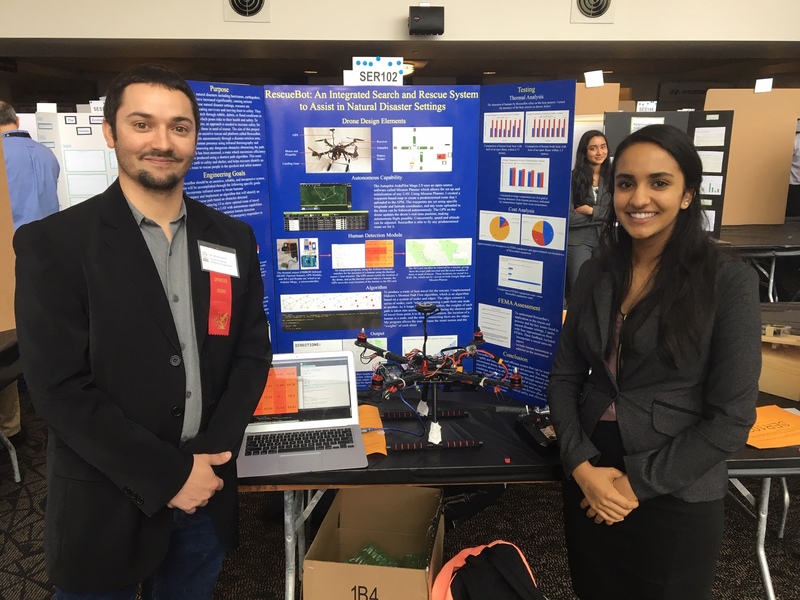 Meghna's project is entitled, "RescueBot: An Integrated Search and Rescue System to Assist in Natural Disaster Settings". Abstract: In recent years, natural disasters including hurricanes, earthquakes, and forest fires have increased significantly, causing serious devastation. In these natural disaster settings, rescuers are responsible for locating survivors and moving them to safety. They must manually search through rubble, debris, or flood conditions to locate survivors, which poses risks to their health and safety. To address this problem, an approach is needed to increase safety for both rescuers and those in need of rescue. The aim of this project is to develop an assistive rescue-aid platform called RescueBot. RescueBot travels autonomously through a disaster-stricken area, searching for human presence using infrared thermography and concurrently assessing any dangerous obstacles obstructing the paths using ultrasonic sensors. Once the area has been assessed, a route maximizing efficiency and safety will be produced using a shortest path algorithm. This route will provide those in need of rescue a path to safety or shelter, as well as rescuers an efficient route to rescue as many people in the quickest and safest manor. Using sonar technology, RescueBot then guides the user to safety or to locations of others in need of rescue, alerting the user to avoid unsafe obstacles along the way. Data generated through natural disaster simulations will be used to test the platform. The SME Pittsburgh Section is pleased to present the SME-PRSEF Student Award to Nikhil of North Allegheny High School. Nikhil's project is entitled, "An RFID-Based Indoor Mapping Tool for the Visually Impaired". Abstract: Spatial and navigational awareness are critical skills for an efficient and productive lifestyle. Unfortunately, such essential tasks are often difficult, dangerous, or impossible, especially in crowded indoor areas, for the visually impaired. Therefore, the goal of this project is to create a cognitive assistance tool to enhance spatial visualization ability for the visually impaired. To achieve this, a phone-based application will be developed that uses radio frequency identification (RFID) technology, GPS-based location tracking, and native activity monitoring software to help enhance navigational awareness, avoid dangerous situations, as well as improve the lives of visually impaired individuals. The SME Pittsburgh Section is pleased to present the SME-PRSEF Student Award to Vedant of Upper St. Clair High School. Vedant's project is entitled, "'Breathing' Battery". Abstract: Global Warming is a huge environmental issue faced today and is caused by greenhouse gases. About 72% of the total emitted greenhouse gases is carbon dioxide. My purpose was to collect this carbon dioxide (eliminating it from the air) and use it to produce electricity. I hypothesized that CO2 gas can be used to run a wind turbine to generate electricity before finally being used as a carbonic acid solution in the electrolyte of a galvanic cell to again produce electricity while also ensuring removal from the air. The SME Pittsburgh Section is pleased to present the SME-PRSEF Student Award to Shanelle of North Allegheny School District. 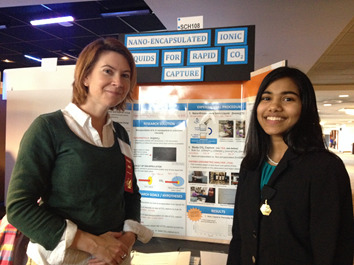 Shanelle's project is entitled, "Novel Nano-Encapsulation for Rapid CO2 Capture and Emission Reduction". Abstract: At a time when climate change is becoming a growing national concern, the reduction of carbon pollution from coal-based power plants is gaining increased interest (as shown by the EPA's Clean Power Plan). Current attempts at carbon emission reduction involve Carbon Capture Systems (CCS), however the chemicals currently being used for these systems are toxic amine solutions. Ionic liquids have recently emerged as promising amine replacements, however their characteristically high viscosity slows carbon capture. In an effort to overcome the high viscosities and slow uptake kinetics of ionic liquids, the study aims to confine sorbent ionic liquids within specific nanobubbles, yielding accelerated CO2 capture. Thermo-gravimetric and uptake kinetic analyses are performed to determine the efficacy of this method. Photo: Award winning poster "Novel Nano-Encapsulation for Rapid CO2 Capture and Emission Reduction"